Victoria Azarenka defeated Svetlana Kuznetsova, 6-3 6-2 to win her third title of the year at the Miami Open and extend her sensational record in 2016 to 22-1. The Belarusian made a super start to the final, hitting the ball beautifully to go up 2-0. However, the serve, which has been the only liability these past two weeks, went astray in the first set with Azarenka committing five double faults. The return game was on the money and when the rallies got going, Azarenka was always on top. Azarenka is the first player since Kim Clijsters in 2005 to win Indian Wells and Miami back-to-back. 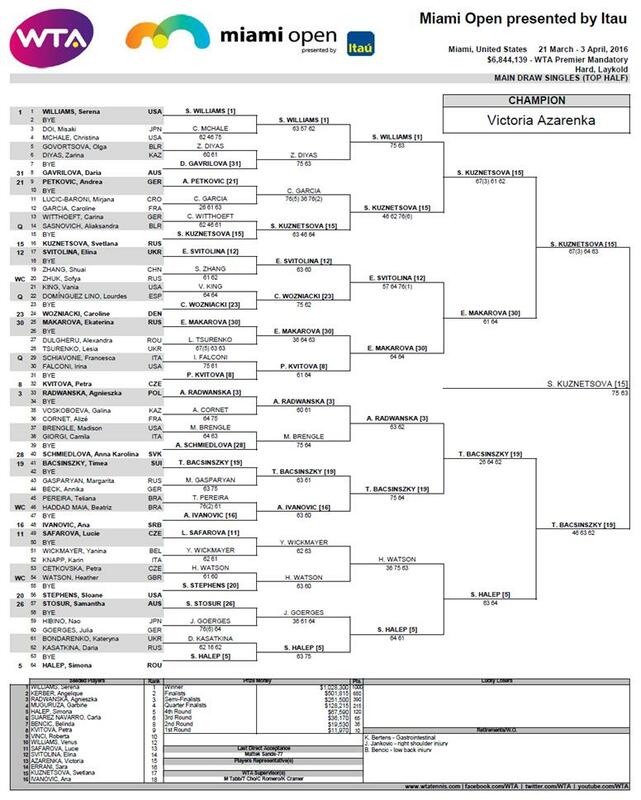 This is some start to the year for Vika…. With the way 2016 is going, there's a 38% chance this is a USO final preview. A Serena special this week…this one that made my eyes pop out as Christina McHale hit more winners than Serena in a set. And Zarina Diyas got in on the action too in the third round! And then Serena ran into Svetlana Kuznetsova who produced one of the best winners to unforced errors ratio of the tournament. And finally, the stats told the story in the first of the women’s semi-finals with breaks of serve alluding Timea Bacsinszky. Oracene GIFs are my favourites. This is another classic. Timea after her third round win over Ana Ivanovic! This is great after a huge point on break point. This is an insane drop shot from Radwanska, which gets the racquet clap from Cornet! And again from Radwanska v Cornet, here’s one of the rallies of the year so far. Caroline Garcia successful with a SABR. Angelique Kerber at her best! And again… this was an incredible winner on match point. This was a stunning rally in the Serena-Sveta match. One of many incredible forehands that Garbiñe Muguruza produced in her fourth round match against Victoria Azarenka. Konta hit some brilliant shots this week, two in the fourth round match against Elena Vesnina (that I can’t find!) and a handful in her quarter-final loss to Azarenka, of which one is linked below. One of many superb points in the Kerber-Azarenka semi-final. Favourite net exchange of this week. Tons of respect between Victoria Azarenka and Johanna Konta after their quarter-final match. And finally, this was lovely between Svetlana Kuznetsova and Timea Bacsinszky after their semi-final. 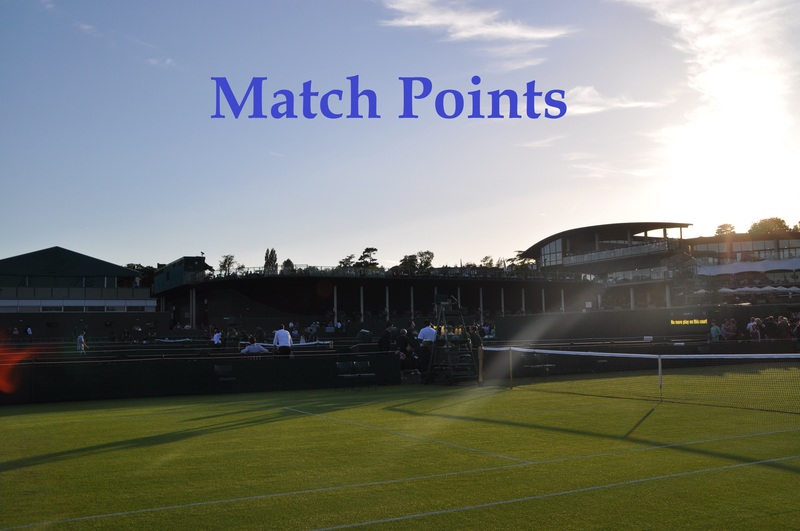 Also, the match point is relevant for best points/shots too! This was nice from Serena about Christina McHale. Serena on McHale: "She can, should, & will be very proud of herself in this match. I think it can also show her how good she is." And this was nice from Venus on Elena Vesnina. Enjoyed this analysis from Casey Bray of the Halep-Kasatkina second round match. Congrats to my fellow blogger, Marija over at Women’s Tennis Blog for nine successful years! Nice quotes HERE in this WTA Insider Notebook from semi-finals day at the Miami Open. And a big thanks to Jake who wrote guest posts for the first two days at the Miami Open: Day 1 is HERE and day 2 is HERE. These can now be found on the guest posts HERE which houses all the posts from readers over the past year… thanks to all. To anyone interested in contributing their tournament experience, please do get in touch at MooTennisBlog@gmail.com! Racket Rally: I forgot to make any changes this week and i’m already losing interest! It’s harder for these two week tournaments. Bosiddon leads the way in the Moo’s Tennis Blog league with Twobc2p top scoring (at the time of writing) for Miami so far. To join RR or update your team, click HERE. 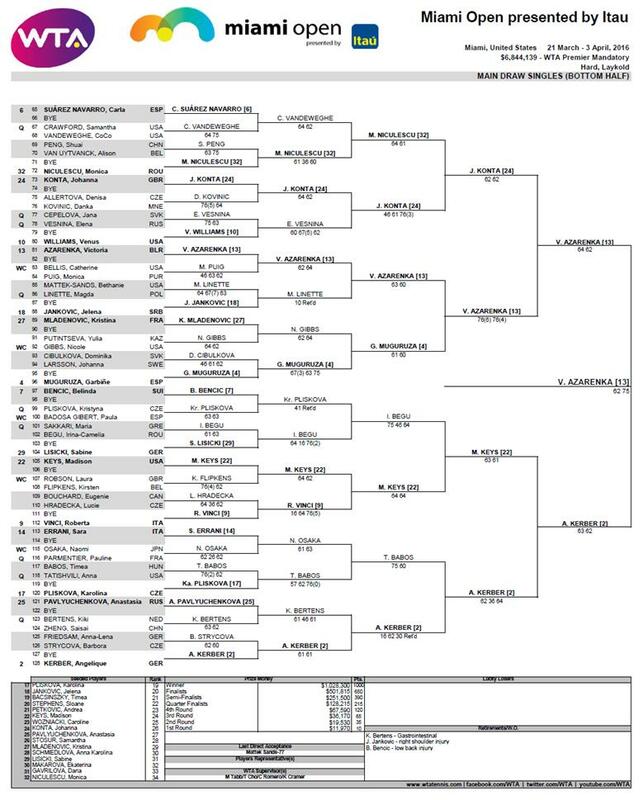 Tennis Draw Challenge: Congrats to dublin101 who was the champion for Miami, correctly predicting Azarenka to win Miami. Moo was 17th… grade for this tournament, could do better! More details on the league and how to join can be found HERE. April 2, 2016 in Match Points, Miami, WTA. Impressive 2 weeks from Vika,winning the Sunshine Double,also a great tournament for one of my all time fav players Sveta,though in the final Vika was just too good! Bring on the Clay Season,my fav time of the year! Vika grabbing the Sunshine double has made my month already:)) Sveta was tired and it didnt help that Vika was ON from the get go except for some double faults. Few rallies in the second set were amazing. Hopefully Sveta’s form will continue to clay season. Cant wait for the play to start on dirt!!! I agree about Kuznetsova though she needs to be careful about how many matches she plays in my opinion. She could well be one to watch in Stuttgart though. This will be a little ATP-heavy owing to the fact that TSN broadcast none of the WTA matches from Indian Wells or Miami this year, literally not a one (and naturally no doubles either). TennisTV is starting to look a lot more appealing right about now in spite of its own shortcomings. Anyway, here are some of my thoughts on the last fortnight and the month as a whole. – There were 12 winner’s trophies awarded to 7 people, with only Lucie Safarova and CoCo Vandeweghe missing out on the Sunshine Double and getting just one championship each. Take a bow Bethanie, Nicolas, Novak, Pierre-Hugues, and Victoria for the amazing accomplishments. I wonder if there has ever been a double completed in both disciplines and both tours simultaneously, or is this the current record? – Lucie’s back! …sort of. A Primiere doubles title is fantastic, but it is her singles game that she is most invested in, and it will be nice to see her back in the winner’s circle there too. Great to see the smile again of course! – There’s someone else whose smile I realised I had been missing: Grigor Dimitrov. He looked very sharp during his win over Murray, regardless of his opponent’s antics. – And speaking of Andy, he did not have a good March at all. Davis Cup aside, he lost his second matches in Indian Wells and Miami to players he should have beaten (although as mentioned above, Grigor was playing very well), and his on-court behaviour was pretty poor, to say the least. Throwing a fit over being given the wrong ball, listless errors, generally foul temper; this was the Murray of long past who would wilt under pressure and regularly trip himself up with the finish line in sight. I dearly hope this is just a passing relapse. – Djokovic may have thrashed the field and won both tournaments handily, but the player who impressed me the most last month has to be David Goffin, as he made it to the semifinals at both events, losing good matches to good opponents (Raonic and Djokovic). Honourable mention to a (mostly) no-nonsense Gael Monfils for showcasing a new weapon in his arsenal: consistency! – We almost got Kvitova vs. Schivaone in Miami. Now that would have been fun. – Lastly, can someone explain what is currently happening with Taylor Townsend? I remember her at Roland Garros two years ago armed with big groundstrokes, a fearless demeanour, and a sensible bit of craftiness that she mixed with her power to plow through several tough opponents, but since then she’s been mostly off the radar. Given that she managed to qualify for the Indian Wells draw (and then immediately lost in straights to Vania King, which I just noticed is who she beat in the first round back at her run at the French Open), this seems an appropriate time to ask what the story is with this young player who showed such potential in 2014. Thanks for being my WTA lifeline, with daily(!) reports of good matches, amusing quotes, and so on. My fingers are crossed that the broadcasting is more sensible in the future, especially when it’s a shared venue. Still, I know I can always come here to find out what I missed. Thanks as always, James! And thank you for the comments, always enjoy reading through them! – Regarding TennisTV, i’d recommend it if you have a decent internet connection. I have the app on my ipad which is generally quite stable. The streams can go a bit in and out but never had any major problems and most tournaments (non-Major) are on there. If you watch a lot of tennis, it’s probably worth it! – The record of players achieving titles in IW and Miami was really quite something and with Beth doing it with two different players was pretty remarkable. -A great week for Lucie, I was hopeful it might give her a much-needed boost in singles but I think it’s going to take a while for her to build up her fitness. -Surprised by Murray’s results through IW and Miami. I happened to catch the end of his match with Delbonis in IW and it wasn’t pretty viewing. -Goffin’s doing well, always enjoyed watching him play. I watched the end of Nishikori-Monfils which was fantastic entertainment. – Good question about Townsend and I don’t really have an answer. I think she’s been injured quite a bit and just hasn’t pushed on. Her game is pretty raw, if one thing’s off, it all seems to come tumbling down. Talent is there though.